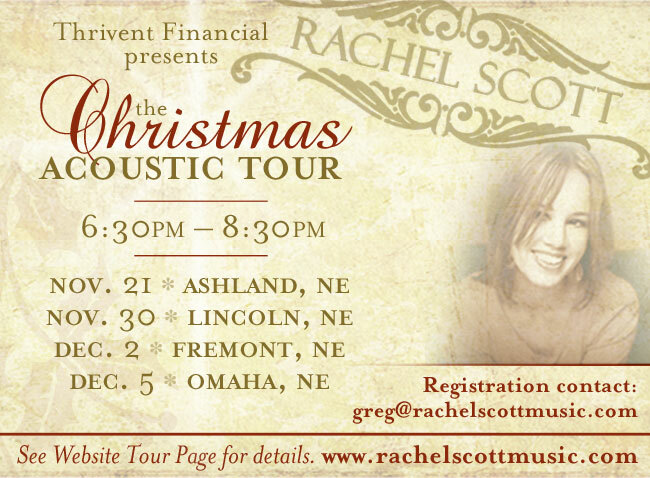 Sponsored by Thrivent Financial - Rachel Scott Christmas Mini Tour is an event you don’t want miss. Providing 4 locations regionally, the event is planned mainly as a fundraiser for Rachel’s non-profit ministry, Rachel Scott Music. The night focuses on live worship with Rachel and band, personal songs, stories, and best of all Christmas music! It is a perfect date night! Beverages, and orderves will also be provided. 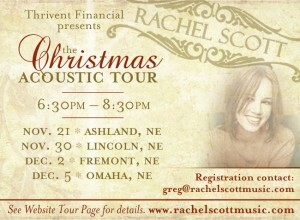 Parents, get a baby sitter, and come, enjoy, listen, laugh, and worship along with Rachel in concert! To plan to attend you must register. To do so simply email greg at greg@rachelscottmusic.com and request to be put on the list. Greg will confirm with you if there are spots left on the list. This is a private event. So in order to come you must confirm with Greg through email. Any questions contact Greg. DOORS OPEN AT 6PM / ARRIVAL TIME 6:30PM / CONCERT STARTS @ 7PM. FOR LOCATIONS AT EACH DATE, PLEASE GO TO RACHEL’S TOUR PAGE AND CLICK ON THE LINK FOR THE DATE YOU ARE PLANNING TO ATTEND. Tickets not sold. This is a reserve only, free of charge event.